I’ve been searching my hotel room like a mad woman for hours. Opening the same suit case, my purse and my carry on again and again, certain that the small case with all my knitting accoutrements (I am in France after all ) has not simply disappeared. Alas, even though I have found every coin lost in prior trips, the case is not to be found. I’m torturing myself imagining just where it could have fallen out of my bag. Well, knitting is kind of up there on the list so I’m not feeling all that much better. I had just packed several of the new needle tips and cords I had purchased from Knit Picks in the lovely new blue/green color. Not that I don’t own a quabillion sets already, the right sizes just all seem to be on projects somewhere. This also means I’ve lost my gauge guide, stitch markers, tapestry needles … I search the room once more and decide now would be a good time to have a nice glass of white wine. OK, now that I am a bit calmer, let’s take a second shot at that list. Monday Update: I waited impatiently until 10 am Monday morning. 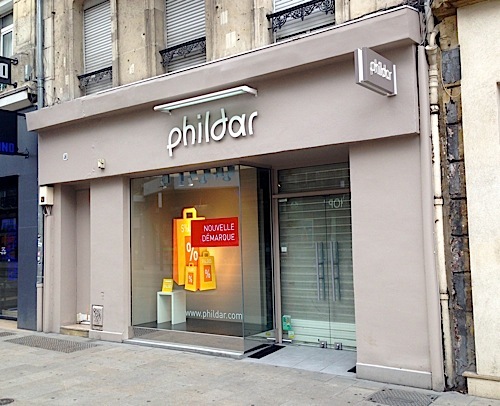 My train was leaving at noon so I had time to run to the Phildar store when it opened. 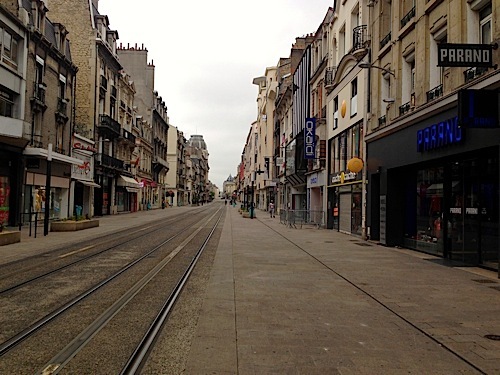 I suspected I was in trouble as soon as I turned the corner and I was the only one on the normally busy street. It seems stores in Reims don’t open until 2 on Mondays. Foiled again. Back to the room to search for knitting stores in my next stop, Strasbourg. Much to my delight, on the first page of Google is a store review by NonaKnits in 2007. Nona, aka Carolyn, worked in my LYS in the Bay Area. We started Bella Knitting together years ago and it was she that inspired me to blog. Clearly this was the light at the end of my needle-less despair. I’ll take this opportunity to reconnect with an old friend and look forward to shopping in Strasbourg. What about you? What would be on your Top 10 Hate to Lose List? Wow…I can feel your pain! On a flight to Spain 2 years ago, with a connection in London, I left my little bag of knitting, with MY Knit Picks interchangeable needles/cords on the BA flight when I deplaned in London. It was only on my connecting flight to Malaga that I realized I’d left them behind! I spent SOOO much time (and money on expensive calls back to the UK) trying to reach Security at Heathrow, which I finally did. And, they did have my bag! I was so happy! Until I got to the airport when I returned to Heathrow, only to find that while the bag and the yarn were there, all of my knitting needles and other tools had been removed, with NO explanation!! Just blank stares, and “I don’t knows”. So upsetting. However, when I relayed this story to Knit Picks when I got back to Florida, they were so kind, they offered me a 10% discount on my next purchase! So, fast forward to Charlotte, NC, yesterday…and guess what?? My set of Knit Picks interchangeables and my Della Q case, as well as my other Della Q with some other circulars – missing! Have searched this house high and low, every bag, shelf, box, you name it — nowhere to be found! Looks like I’ll be making some additional purchases on their site, again, so that I can participate in my local Waxhaw Yarn Bomb, with pieces due by the end of September!! Honestly…you can’t make this stuff up! 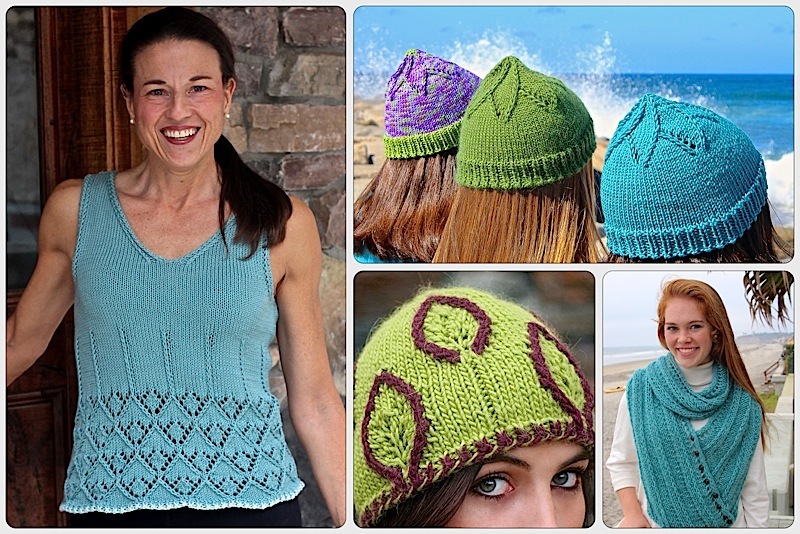 This entry was posted on July 28, 2014 by Laura Cunitz in General, Yarn & Yarn Shops and tagged Knitting Needles.